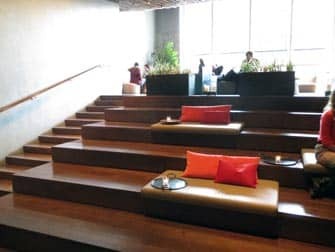 Row NYC Hotel in New York is a modern and vivid hotel, that is luxurious yet affordable at the same time. The enormous hotel is situated at a top location near Times Square. Very fast Wi-Fi is provided throughout the entire hotel, for you to update those back home about your adventures. 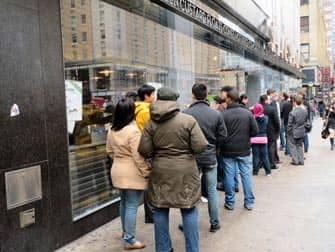 You could for example send your relatives a picture of the lively 8th Avenue-view you experienced from the iMac internet lounge. Or brag about how you’ve worked up a sweat at the Fitness Center that’s open 24/7. 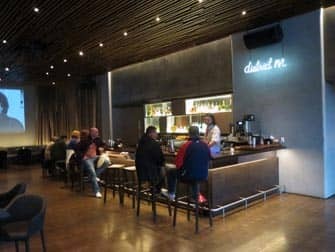 Make sure you don’t forget to get out from time to time, for even groceries can be done indoors at Iconic M, and a night in at the hotel bar District M can pretty much compete with a night out on town. District M serves nice Neapolitan-style pizzas, cheeses and charcuterie. Not to mention the exquisite cocktails and the live music entertainment. 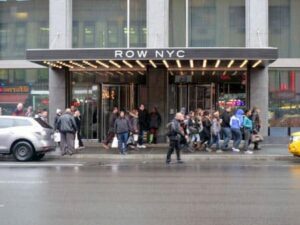 Hotel Row NYC offers 1,331 rooms that are all at least equipped with a large LCD TV, a desk with ergonomic chair, double blinds for an adjustable level of light and privacy, a shower-head with multiple settings, a large mirror and an iron plus ironing board just to name a few things. While you walk down the hallways of the 28-storey hotel, you’ll be taken on a visual tour across New York’s boroughs and neighbourhoods. Once you enter your room, you will find a simple, clean yet cozy design. White and grey are the base colours of every room and they are combined with the fresh and vivid hues of New York’s subway lines. The Times Square-related texts on the coloured walls, like ‘Open 24hrs’ or ‘Lights Out Please’, add to the urban vibe while the blackout blinds wish you a ‘goodnight’. 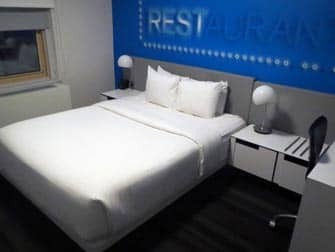 Hotel Row NYC is only a 30-minute cab ride away from La Guardia Airport, and around 45-60 minutes from JFK and Newark Airport. But the major bonus about this hotel must be the fact that it is situated near Times Square and the Broadway theatres. This makes it possible to put your head to rest in your peaceful, comfortable hotel room, only 5-10 minutes after a night full of musical impressions. Up early? Think about what a beautiful start of the day it would make walking around Times Square! Afterwards you can head straight to the other side of the hotel, where you will find loads of deli’s that provide a solid breakfast for a reasonable price. And for my fellow burger fans: there’s a Shake Shack right across the street. Once your stomach is filled you can easily grab one of the Hop on Hop off buses that stop right in front of the hotel.